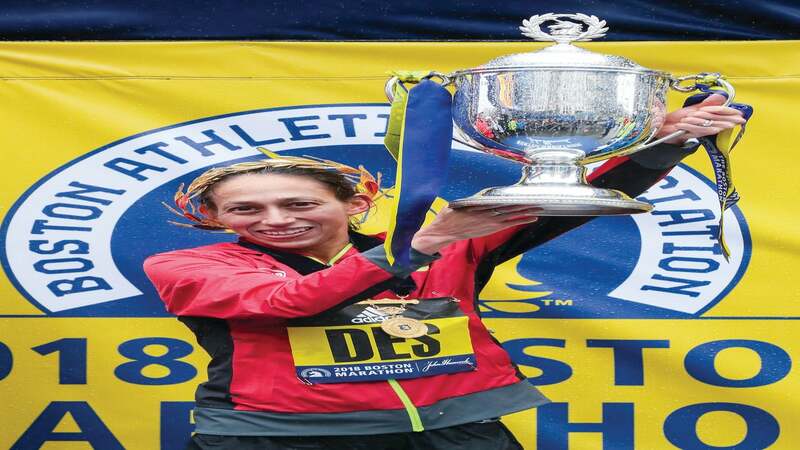 When she stood on the starting line of the 2018 Boston Marathon, the rain pouring down, the headwind blowing in her face, the temperature chilling her body, Desiree Linden had no choice but to laugh. As a kid, Linden’s favorite reading material was Calvin and Hobbes, a comic strip that features the adventures of six-year-old Calvin and his stuffed, cynical tiger, Hobbes. At age 35, Linden has gained more than a few fans because of her quick wit and subtle wisecracking. But this year, there’s no avoiding the attention. Linden, who is a two-time Olympian in the marathon, returns to race Boston for the seventh time, with another distinction: defending champion. Last year, she became the first U.S. woman to win the event in 33 years, and when she lines up at the start in Hopkinton, she’ll have the honor of wearing bib No. 1. 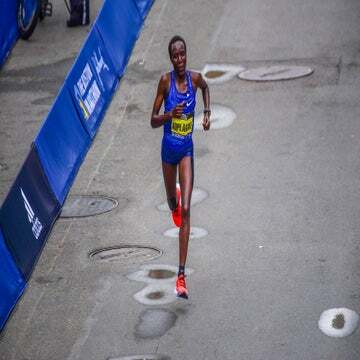 She’s counting on her experience to contend among a talented professional field, which includes fellow American Jordan Hasay (2:20:57, the second-fastest in U.S. history), Sara Hall (2:26:20), and top international athletes like the 2017 Boston champion Edna Kiplagat, Woknesh Degefa (2:19:53), Meskerem Assefa (2:20:36), and Mare Dibaba (2:19:52). 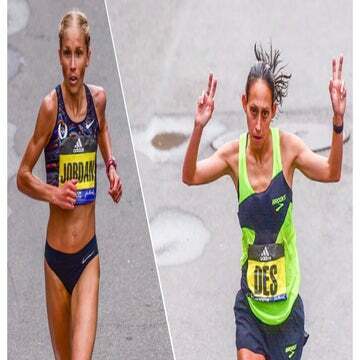 Linden’s personal best, 2:22:38, is from the 2011 Boston Marathon, when she was runner-up by just two seconds. Linden, who spent part of the training cycle in Phoenix, before going home to Charlevoix, Michigan, has had to learn how to balance the increase in requests for appearances and promotional events with her need to continue training, recovering, and focusing. The travel involved, as well as the demands on her energy, have been challenging at times—but also rewarding. She knows when to cut back on mileage or move important workouts to days when she’s feeling more rested. We had a little rap battle this morning. @runmeb dropped some Snoop Joggy Jog on us and it was game over. Good fun! She also got some valuable advice from a certain other U.S. Boston Marathon champion—Meb Keflezighi, who won in 2014. “He said, ‘When you get to crunch time, just pick the stuff that’s super important and just do that. Other times, if you can do it all, go for it, because it’s great for the sport, it’s great for you, and it’s great for Boston,’” Linden said. She’s prepared to go for the win again, but the ultimate goal is to compete as well as she can in a race where “you train for the course, not the distance.” Boston is notoriously tactical, and Linden knows the terrain and the conditions better than most. And what if the forecast holds, which currently shows a 100 percent chance of rain, Linden will hope for the worst. If Mother Nature cooperates, there’s no doubt the returning champ will be laughing all the way to Boylston Street.